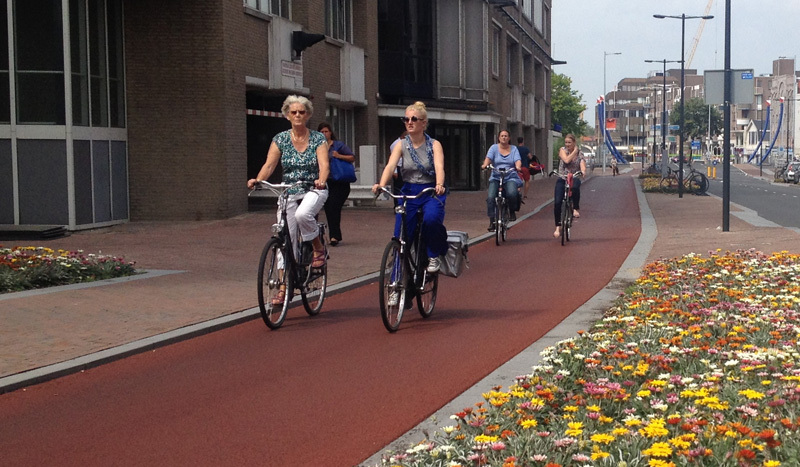 City streets used to be designed with only the private car in mind, but that has changed (in The Netherlands at least). 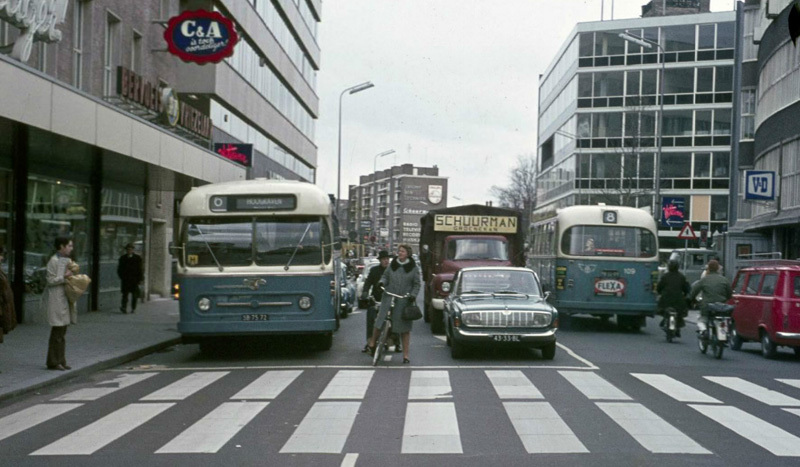 In many Dutch city centres the car is no longer the dominant form of transport and so the streets can become places. These places need to be attractive and safe, also for the most vulnerable road users: children, the elderly and people with disabilities. A city centre street is only good enough if these groups can use it freely. In the afternoon that I filmed in a recently reconstructed street in Utrecht I saw people of all of these groups. That must mean the street was successfully redesigned. This new one way cycle track is 2.5 metres wide. That means people can ride two abreast and there is still room to overtake. Left and right the flower beds with blooming Aster flowers. 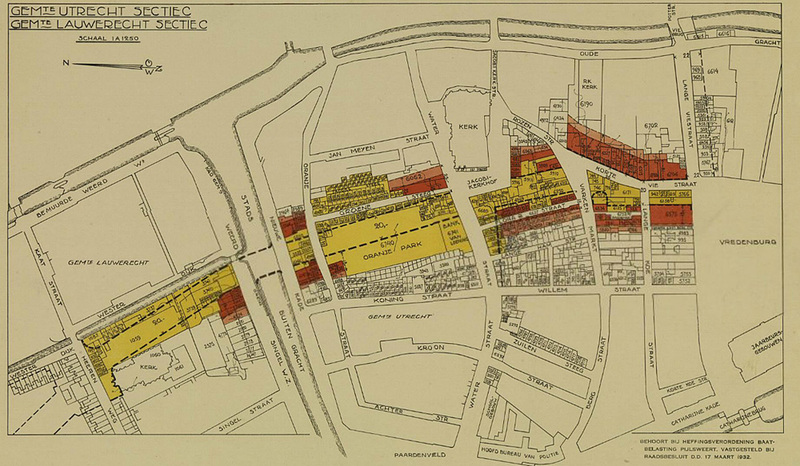 Sint Jacobsstraat is a strange street in the historic city centre of Utrecht, in the way that it didn’t exist before the 1930s. The street (of just 300 metres long) was planned right through an infamous working class neighbourhood, and named after the church it passes; the church of Saint James (Jacobi). The street was officially built for traffic reasons, but it is also whispered that the ruling class at the time tried to break up that part of the city and spread the former residents over the entire city to reduce the social problems they supposedly caused. A wide street with large buildings required a lot of space. Many old homes in some tiny streets, a square and a neighbourhood park were sacrificed to build this street. Tall buildings would conveniently block the sight on what remained of the ‘slums’ of the working class. And so it was done. By 1940 many of the buildings were destroyed. 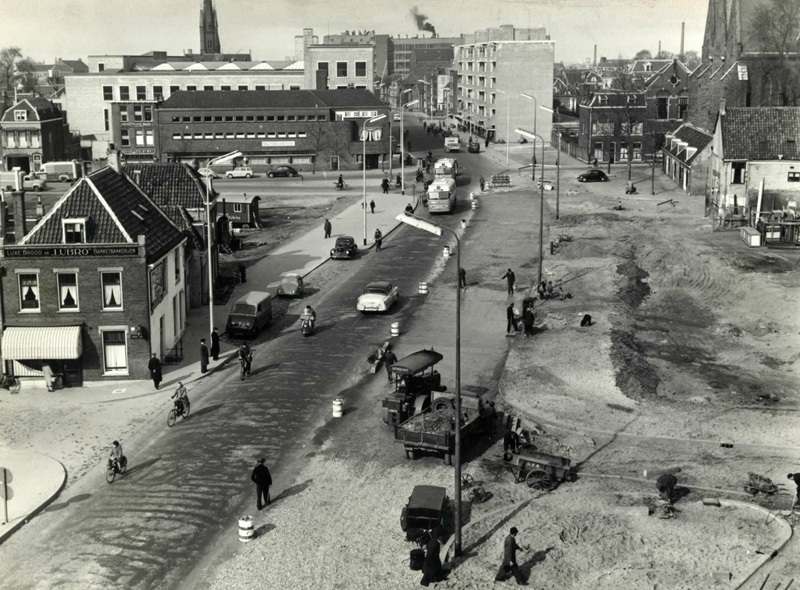 Then World War II reached The Netherlands and the development came to a standstill. The first new buildings were only finished well in the 1950s. A bank and some flats in an apartment building at the north end of the street. But the reconstruction did not progress very fast. 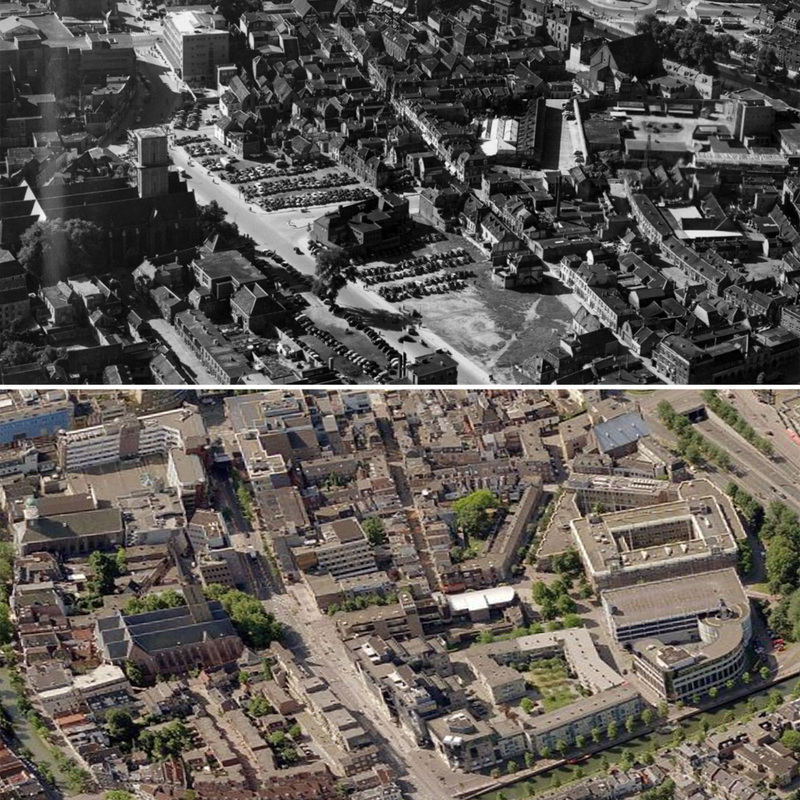 Large areas of empty city space were used as parking lots, not 10 years, not 20 years but well into the 1970s. Long enough for me to remember. By the time the last apartment building was finished in the 1980s the 1950s bank building was already due for replacement. Around the turn of the century the street was finally finished. It was built as a street to carry a lot of traffic. There were multiple lanes for motor traffic and only in the widest parts (or parts that had not been filled in yet) there had been cycleways. Some narrow on street cycle lanes existed until December 2014 when the reconstruction started. The street had not been a through street since the 1990s when Potterstraat and Lange Viestraat were closed (I explained that in an earlier post). With these feeders closed, it meant there was also almost no traffic left here. Today, the only important destination for private motor traffic is a parking garage for a shopping mall. Coming from Vredenburg and looking north, the first part of the street is completely closed for private motor traffic. It is only used by buses (lots of them!) and people on bicycles or on foot. The remaining part of the street further north now got a road diet and it was transformed to reflect that it is now a 30km/h zone. Only one travel lane in each direction remained and there are no longer any dedicated turning lanes, nor can buses be passed at the one remaining bus stop. The entire length of the street now got separated cycle tracks, mostly unidirectional and at least 2.5 metres wide. At the square in front of Jacobi Church there is much more space and to make crossing easier, bidirectional cycleways were built there on each side of the street. Cycleways in a 30km/h zone are not common; with such low speeds mixed traffic is the rule. But in this particular street there are so many buses that the protected cycle tracks were seen as necessary. All side streets got raised entrances that are interrupted by the cycleways to make sure that it is clear that cycling has priority over turning motor vehicles. The street varies in width from a mere 19 metres to almost double that at 35 metres. The largest intersection with Waterstraat used to be signalised. But road managers try to reduce the number of signalised intersections in the Netherlands and this was one of the intersections that no longer needs traffic lights. The beginning of the street in 2015. The new design in the background doesn’t align with the old, but it will have to do for another year. The building to the right is not yet finished. When it will be (late 2016) the street can also be finished. One of the reasons for this street’s new design was to give cycling more space. So it was ironic – to say the least – that during the reconstruction it was forbidden to be used by people cycling for about half a year. That is because the city said there were no options for a detour for the many buses. The detour for cycling was much easier to arrange, but it led to questions in the council. To no avail: the plans were not changed. The street was supposed to become more liveable as well, so the residents were also very cross about 12 trees that had to be removed. Especially when these residents found out that the designers chose to do this “for reasons of symmetry”. But that too was not changed. New trees will replace the 27 year old trees that were chopped down, but the 19 new trees will only be planted this autumn. Some spaces that will get low shrubs (which can also only be planted in autumn) are still empty. But some stunning new Aster flowerbeds were already created. These blooming flowers are very nice. The splashes of bright colour really make the street very attractive. Not only for humans, I saw a lot of bees in them as well. Great, because bees have a really hard time now. Other street furniture items still have to be placed: under ground waste containers. Their future locations are covered by concrete plates. The total number of bicycle parking racks is 212, but that used to be 270. The council hopes that after the reconstruction the use of the racks will be different and so fewer racks are needed. They promise to monitor if the number of bicycle parking racks is sufficient. What really changed the street is that the travel lanes were reduced in width and number, giving it a very different atmosphere. It is much more people friendly now, but even that part of the reconstruction is not entirely finished. In the 1980s a passage over the beginning of the street was built to connect the shopping mall “La Vie” to a clothing store across the street. But that passage was little used and it had been closed to the public soon after it was built. The mall is now being updated and after almost 30 years that ugly passage will finally be removed. That means the street will get more daylight, but it also means it can only be finished when the mall reconstruction is finished first, which is expected in the second half of 2016. As I have shown you before, cycling infrastructure is not only for people cycling. More groups in society benefit from redesigned streets. With cycle ways of at least 2.5 metres wide for one direction, side walks that are at least 2.4 metres wide and crossings that are no longer than the width of a single travel lane of 3.1 or 3.25 metres, this city centre street has become very safe for the most vulnerable road users and it is good to see (also in the video) that they indeed use the street in high numbers. That it has also become beautiful with those flowerbeds makes this redesign all the more attractive. Video showing the history and the reconstruction. Video showing a ride and before and after images. When I look at how a street is designed in the Netherlands, I often try to conceptualize how the situations in these pretty pictures could be translated from the way of doing things in another country to the U.S. I would sometimes refer to the before video shown above as an example of how a on-street bike lane could transition to a bike path to go behind a bus stop in the city of Los Angeles. Even for something like that its difficult to get the space or money to make the path behind the bus stop in Los Angeles. The opportunity to rework an entire street is relatively rare in the U.S. Once a street has been constructed its likely that the curbs and sidewalks will remain the same for decades. Some of the curbs and sidewalks where I live in Los Angeles are stamped with dates from the 1930’s. There was a half-cent sales tax measure for highway and transit improvements in Los Angeles County that was approved by voters in the presidential election when Barack Obama was first elected in 2008. Amazing, it needed over two thirds voter approval and even in the midst of a recession it got enough votes. One of the upcoming transit projects is along Van Nuys Blvd in the San Fernando Valley portion of the city of Los Angeles. There is $170 million set-aside in local funds for this transit upgrade. Federal and state grants could increase that amount considerably, but the federal government usually only goes up to 50% of the funds needed on a transit project. Due to the project requiring a environmental study there are six alternatives being considered. Three of those propose to build either a light-rail, streetcar (tram), or bus rapid transit down the middle of the street. Another proposal is to create a curbside bus only lane. If you want to know what I look like, I’m near the camera in the orange shirt on page 2. Although the excitement is for the light-rail project, its projected cost is $2.7 billion as you can see on page 37. The federal government has already told the project team that they are not interested in giving them enough money to install light-rail. People coming to the meetings see the alternatives as a menu which contains choices that all have the same boarding price for passengers. So why not pick the most expensive one on the menu and so overwhelmingly they are for light-rail and will be very disappointed if they don’t get that since its listed on the menu. A reason for the much higher price for the light-rail compared to the tram is that the project team decided that there must be a tunnel for the light-rail in the higher population density area of the route. The tram and BRT would not get a tunnel on any of the route. I find the street very unattractive for pedestrians as you can see from the pictures showing the current conditions on pages 17, 19, (the most densely populated community of the San Fernando Valley, which has the busiest transit stops), 21 (this photo shows a absolutely ugly situation for pedestrians, not unusual for this street). 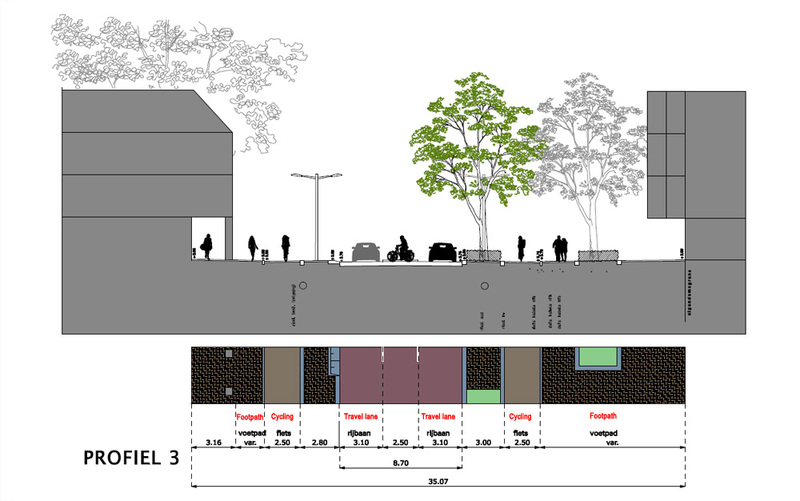 The lovely looking after project completion drawings make it look like the street will be completely transformed. That’s not true. The focus is only on installing the transit. The sidewalks and curbs will remain as they are. On page 27 is a street in the city of San Fernando. Quite a bit nicer looking than Van Nuys Blvd in the city of Los Angeles. A common theme in all of the alternative designs is that there is no separation of bicycles from moving motor vehicles due to the project team wanting to use that space for the transit. You can see the sharrows (shared lane marking) that shows a chevron atop a bicycle symbol on page 16 in the bus only lane, on page 18 on a through lane for mixed motor vehicles and on page 24 of the median running BRT drawing where a cyclist is depicted riding down the middle of a motor vehicle through lane. At one of the community meetings the project team manager described sharrows as a enhancement for bicycling. 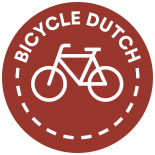 Its a discouragement for cycling and a encouragement for motorists to honk at the few cyclists brave enough to get in their way. My thoughts on this project is instead of just concentrating on only installing a transit upgrade, why not make the street more attractive to bicycle and walk along also. 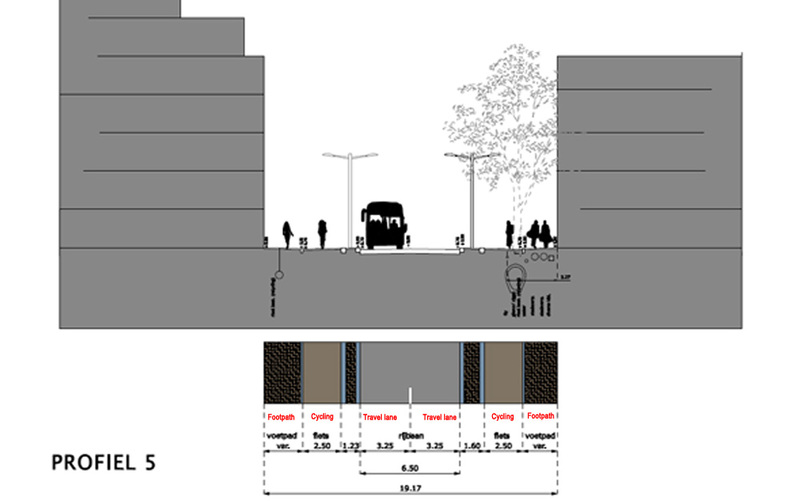 Move the curbs a little bit closer to the center of the street, widening the current sidewalk area enough to include a cycle track on both sides of the street. A narrow cycle track would be a major improvement over what exists for cycling now–which is absolutely nothing. This would not only make it more inviting to cycle (there is no bike lane currently), but would also enhance the pedestrian environment by making it have a more wide open appearance. The city of Indianapolis installed a 8-mile beautification of a street that includes a cycle track. This cost $63 million, which includes $2 million worth of art. That’s the best example I know of in the U.S. where a commercial street comes closest in design to what I’ve seen in videos of the Netherlands. That makes me wonder why the LA county MTA project team is stating that the 9.2 mile curbside transit project along Van Nuys Blvd is estimated to cost $294 million (page 37 in the first link above). It would seem a wiser use of the money to include improvements that would make major enhancements to the environment of the corridor rather than just focusing on transit upgrades. Plucking down a large bus shelter on a ten-foot wide sidewalk, as is shown on page 22, is not a overall improvement. O.K., that concludes my thinking out loud on how to incorporate some of these street corridor improvements in Utrecht into a transit upgrade project in the city of Los Angeles. Now if I can convince the powers that be to think of this transit upgrade in terms of a complete street redesign within the budget constraints that exists for the project. The bus stop shelters at 00:27 and 1:01 both seem to have disappeared. Where do people stand if they are waiting for a bus in the rain? The bus stop at 00:27 has been replaced by a bus stop in another street. (Before this street, to the left from the starting point of the video). The bus stop at 1:01 has been relocated to 00:37 where you can see to the right that the entire side walk is covered. So that is where people can wait and not be in the rain. Not sure if applicable here, but it’s very common in the Netherlands that only the bus stops on the inbound lines to the city center have shelters. That’s interesting… what is the reason? It is not so much inbound or outbound but whether a stop is mainly used as a stop where people board or leave the bus. You can imagine that at the end of a line more people will leave the bus than will enter it. That is why you do not need the same features for that stop as for a stop where more people board the bus than leave. This goes for width of the stop and also features such as shelter and seats. I mentioned this before in the bus stop post. Most bus passengers use the bus to get to and from the city center. So bus stops on the outbound side are usually by people exiting the bus. People waiting for and entering the bus are usually on the inbound side. Of course, this doesn’t apply when there is an important destination at the outbound side of the bus line, e.g. a hospital or university. But most buses will terminate somewhere in a residential area. Hey Mark, I just invented a new way to see if a cycle path needs to be widened. The test goes like this: If you cannot lay perpendicular to the curb of the cycle path and fill it’s entire width, then it is too narrow and must be replaced ASAP. Cycling in Edmonton from the eyes of a Teen. I was playing on the joke that the Dutch are tall. Taller than Americans now. Apparently, a lot of other societies are taller than us, now. Americans have fallen back to 26th tallest. That still does leave quite a few of the nearly 200 other nations worldwide shorter than us, though. People speculate as to why, but I have heard a lot of possible reasons, including everything from unhealthier lifestyles choices to more people of shorter stature immigrating to the US in recent years. Whatever the reason, we just don’t seem to be getting any taller (and haven’t been since about 60 years ago). That is the way sidewalks in India are measured. People must sleep on the streets, and the pavement should be wide enough to lay down. Except of this, it is better to make sidewalks a bit wider, groups of people might walk into different directions, shopowners tend to place advertisement in the street, or some goods. All the stuff you need for a vibrant living street. So more space for pedestrians & cyclists is necessary to have a vital street. Thanks Mark for digging in the young history of this street, good to see it has been changed for better now! 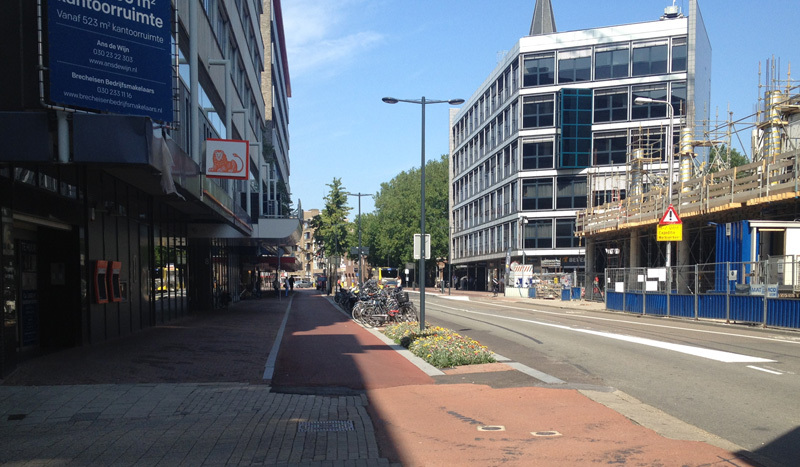 This entry was posted on 25 August 2015 by Bicycle Dutch in Original posts and tagged before and after, disabled people, history, urban planning, Utrecht.